Central Islip is a census designated place (CDP) located in Suffolk County where more than 35,000 people reside. The New York Institute of Technology and the Long Island Ducks club sports team both call Central Islip their home, and this 7.1 square mild CDP also boasts a train station, a baseball stadium, and more than a dozen churches. Within Central Islip, approximately 8.5 percent of households consist of a senior aged 65 or older who lives alone. Seniors often need extra help and support staying engaged with their communities and planning for the future. Mark S. Eghrari & Associates, PLLC can help. To find out more about the ways in which our firm can be there to provide support to seniors in Central Islip, give us a call today. The website for the Town of Islip: On this website, you can learn about nutrition programs, recreational opportunities, transportation help, social programs catering to seniors, and more. The Central Islip Senior Center: This senior center can be contacted via telephone at 631-595-3508 or you can visit the center at 555 Clayton Street, Central Islip, NY 11730. There are many programs offered at this center which older people can take advantage of to enrich their lives. 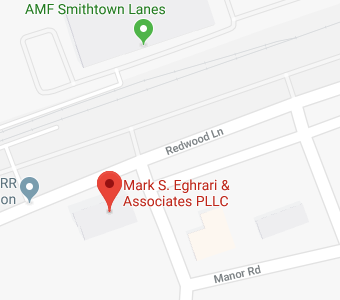 Mark S. Eghrari & Associates PLLC can help you to understand the types of benefits and services that you can take part in locally. If you need more intensive support, we can also help you to make sure you have plans in place to qualify for Medicaid coverage of nursing home care. Seniors need to be aware of when a visit to court may become necessary and where court proceedings take place within the Central Islip area. Going to court may become necessary to probate an estate after a death, or may become necessary in the event that a loved one becomes incapacitated without an incapacity plan. If someone is not able to make decisions on his or her own any longer, a guardian or conservator may need to be appointed unless advanced plans were made such as the creation of a power of attorney. The NY Courts website: As this website explains, the court in Central Islip that handles probate and estate matters is the Surrogate’s Court for Suffolk County. This is the court that presides over the probating of a will, problems with the trust administration process, and proceedings to have a guardian or conservator named. The Surrogate Court for Suffolk County: You can reach this court at 631-852-1713 to find out details about court proceedings and to find out how to file paperwork with the court to initiate probate or guardianship proceedings. The court is located at 320 Center Drive, Riverhead NY 11901. Many Central Islip seniors eventually require Medicaid to pay for the costs of care that they need as they grow older. Medicaid is typically the only source of payment for nursing home care unless you need skilled nursing care and meet very specific requirements set forth by Medicaid. Medicaid can also provide financial help in circumstances where you need costly care that Medicare won’t pay for or when the costs of Medicare become prohibitive. The New York State Department of Health: You can make use of the FAQ webpage on this site which tells you everything you need to know about Medicaid eligibility, qualifying criteria, timeline for getting benefits, and more. This resource will help you to learn a lot about what you need to do if you want Medicaid to cover you. Information on selecting a nursing home: If you must go into a nursing home, you likely want to make sure Medicaid or your other insurer will pay for it. You can use this resource to find Medicaid and Medicare approved facilities. In other words, the resource should help you to find a care facility where you will get the care that you need and be happy. Medicaid provides important benefits, but it’s means-tested so you could be locked out of coverage if you don’t have a plan in place. Mark S. Eghrari & Associates PLLC will help you to make sure you can follow requirements for getting covered without having to impoverish yourself first. Mark S. Eghrari & Associates PLLC can provide you with help understanding the rules for estate tax and making smart choices about how to shield as much of your wealth as possible from being taxed. Central Islip elder law attorneys at Mark S. Eghrari & Associates PLLC can provide the personalized help that you need to make smart choices associated with your estate. We can also help you to take advantage of benefits and programs that help you to enhance your quality of life as a senior and we can assist you in preparing for end of life issues. When you are getting older and thinking about your future, join us for a free seminar to find out how we can help. You can also give us a call at (631) 265-0599 or contact us online at any time for personalized advice.